With the intense singing actress Hildegard Behrens as Santuzza, there is no doubt that Cavalleria Rusticana is a life and death struggle. Vasile Moldoveanu is Turiddu, the ne’er do well who got the unmarried Santuzza pregnant, then left her for another man’s wife. 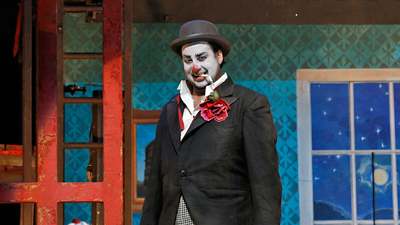 The intensity blazes just as high in Pagliacci, with the incandescent Jon Vickers as Canio, the clown who must go on stage knowing his wife (Jeannette Pilou) is planning to run away with a younger man. The magnificent Sherrill Milnes is Tonio.